▷ Opel Navi 900 update. Speedcam for your maps. Download update. Free custom download. 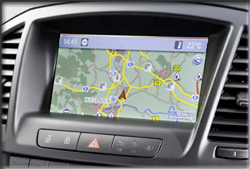 In order to update your GPS device: Opel Navi 900 with the latest update, follow next instructions. First of all, be sure you got the update file for your Opel Navi 900 device, downloaded from SpeedcamUpdates.com. Turn on the ignition of your Opel and plug the USB stick into the USB slot of your Opel Navi 900 device. Press the CONFIG button and select the menu item "Navigation settings". In the Settings menu select Import from the own point of interest. The camera data are now automatically loaded into the navigation system. This may take a moment. Do not interrupt! In the same menu where is the option "Import OWN SPECIAL DESTINATIONS" - select the option located down at all, "Special Notice myPOIs Destination"
In this menu, select "Navigation Options", then "Map options" and then "View POI on the map"